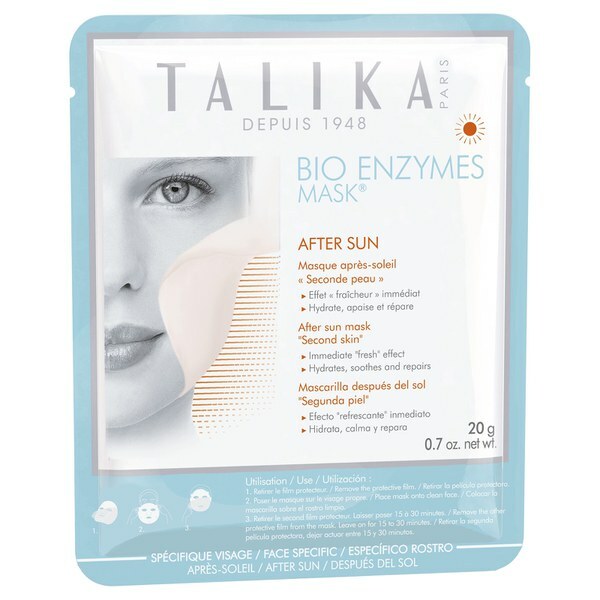 Calm and relieve your skin after sun exposure with Talika Bio Enzymes Mask - After Sun, a serum-infused, biocellulose face mask saturated with a cocktail of beneficial ingredients to soothe, hydrate and repair your complexion. Biocellulose is a natural nanofibre that is 100% biocompatible with skin; it has been traditionally used in surgery to aid healing, and in face mask form, harnesses a high concentration of active ingredients for optimal delivery and efficacy. Clinging comfortably like a 'second skin', the face mask provides an instant fresh feeling and infuses the epidermis with Hyaluronic Acid and antioxidant Alpine Herb extracts to plump skin with moisture, reinforce the natural barrier and relieve dehydrated and damaged skin after sun exposure. Expect a repaired and regenerated complexion. Apply the Bio Enzymes Mask® After Sun after a sun exposure. Remove the protective film. Place Mask onto clean face. Remove the other protective film from the mask and leave on for 15 to 30 minutes. Aqua (Water/Eau), Butylene Glycol, Glycerin, Dicaprylil Carbonate, Saccharide Isomerate, Arnica Montana Flower Extract, Chamomilla Recutita (Matricaria) Flower Extract, Gentiana Lutea Root Extract, Achillea Millefolium Extract, Bambusa Textilis Stem Extract, Citrus Grandis (Grapefruit) Seed Extract, Pinus Palustris Leaf Extract, Polyacrylate-13, Polyisobutene, Caprylyl Glycol, Alcohol, Ethylhexylglycerin, Parfum (Fragrance), Phenoxyethanol, 1,2-Hexanediol, Polysorbate 20, Sorbitan Isostearate, Sodium Hyaluronate, Citric Acid, Sodium Citrate, Artemisia Absinthium Extract, Tocopherol, Disodium EDTA, Limonene, Linalool.